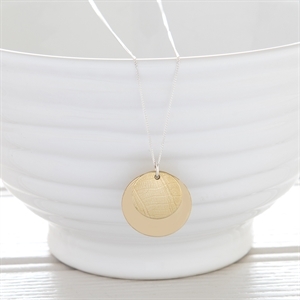 This gorgeous necklace features a disc with the imprint of an individual leaf on a larger polished brass disc. Perfect for a 21st anniversary gift! Brass will naturally develop a patina over time and if required can easily be restored to its original shiny appearance by rubbing gently with a soft cloth and some lemon juice or by using a silver cloth. Outer Disc measures 24mm in diameter supplied on an 18" sterling silver curb chain. 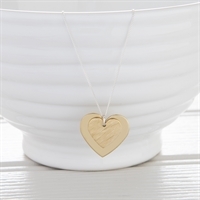 Please note that your jewellery will be made to match as closely as possible this photograph, but as all our jewellery is handmade and from upcycled brass please allow for slight variations in design.